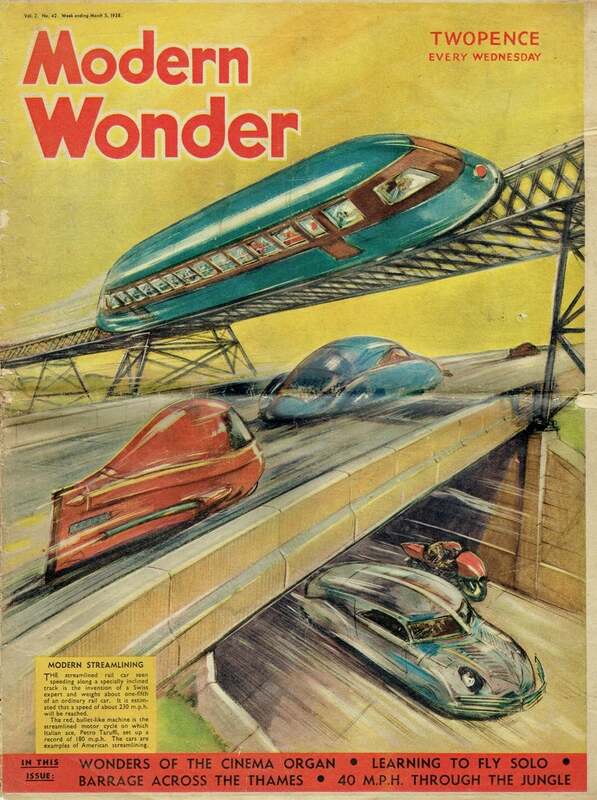 Our cover design this weeks shows some of the most recent developments in streamlining, and included in the picture is a remarkable streamlined model railcar—two photographs of which appear on this is claimed to herald a new railway transport. Its inventor, Professor Kurt of the staff of Zurich University, has introduced many innovations in his model which has already been tested successfully. The colourful pictures promised people that things would be getting better soon. Even if that wouldn’t turn out to be the case in the most immediate sense. The railcar, inclusive of freight, will weigh only about one-fifth of a present-day railcar and in order that high speeds may be maintained with safety, all the wheels and the rails are inclined to the extent of about thirty degrees. This makes it almost an impossibility for the wheels to jump the rails. The setting of rails and lines at a tangent also permits the railcar to bank very steeply, thus providing for a higher average speed than is at present possible. The model of the railcar seen in the photographs is about four feet in length, and two different types of, railcar have been made. One is driven by a little petrol engine, the other by a propeller, the pitch of which can be varied, enabling the propeller to act as an air brake. 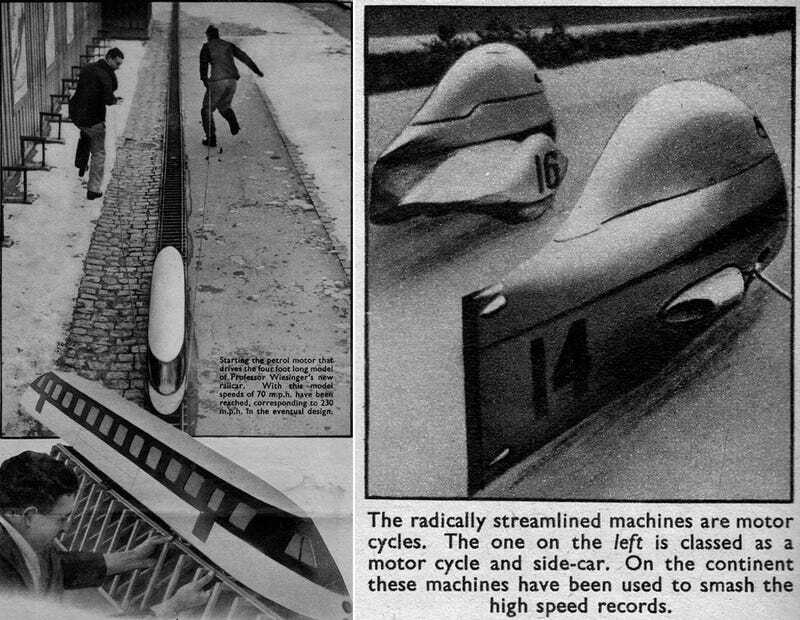 Experiments with Professor Wiesinger’s models have been carried out at Zurich where a track measuring some nine hundred feet in length has been built. On this track, speeds up to seventy miles an hour have been reached in safety. A speed of seventy miles per hour with these models, corresponds to a rate of about two hundred and thirty miles per hour with a full-sized car of the same type. This means that a journey from, say, London to Darlington, could be carried out in the course of about an hour. At present, the fastest trains take three and a quarter hours over the run. Built on overhead rails, the new system could be brought right into the heart of great cities and, in the country districts, property would not be affected to the same extent as if the railway had to be laid on the land itself. 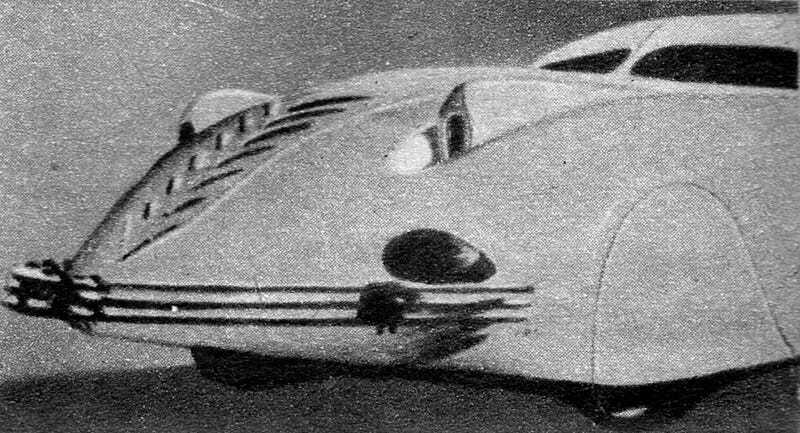 Other notable examples of modern streamlining illustrated on this page include a powerful saloon car and motorcycles that, with their curved roof and fluted sides bear a remarkable resemblance to aerial torpedoes. The promise of good times ahead isn’t always something that society can follow through on. Britain had over half a decade of war ahead of it. But you can’t blame the editors of Modern Wonder for dreaming. Sometimes the pulpy dreams of magazines are all people have in dark times.